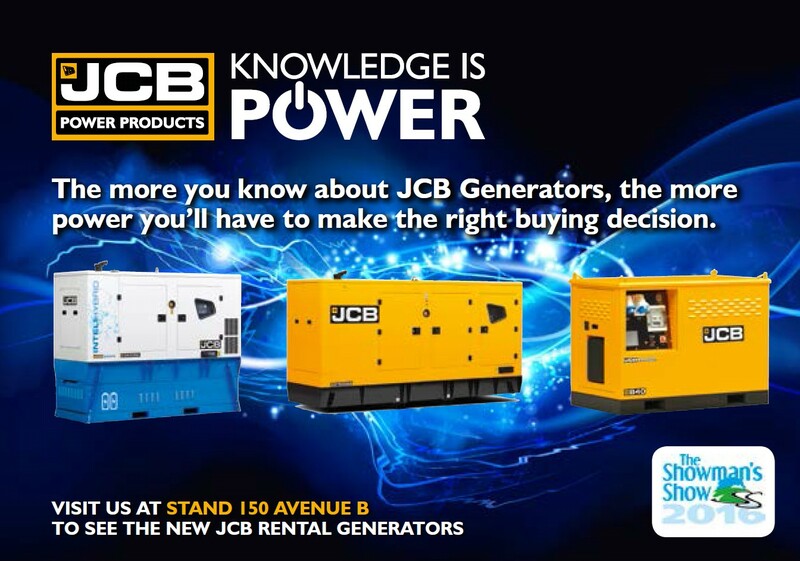 We are proud to be exhibiting with JCB Power Products at The Showman’s Show on Wednesday 19th and Thursday 20th October 2016 where JCB Power Products will be revealing their new robust G100RS Rental Generator. Other generators on display will be the G66QSi Inteli-Hybrid Generator and the B40 Battery Box, both offering significant savings in fuel, CO2 and cost. Plus, find out more about LiveLink for Power. Monitor and manage your generators anywhere in the world and maximise productivity, increase efficiency and reduce your running costs! Don’t miss this opportunity to come and see a range of JCB generators and the chance to speak to us. Plus, JCB Finance will be on the stand to provide you with a fantastic show offer – not to be missed! To register for The Showman’s Show, click here.